When your cubicle desk looks like everyone else's, you'll do anything you can to differentiate your space. 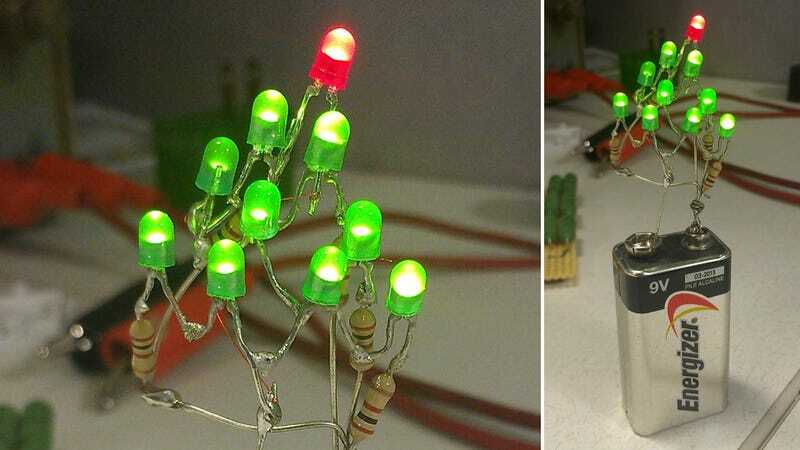 And if you're looking for a unique way to bring a little festive cheer to your 9 to 5 drudgery, check out this adorable and minimalist 9-volt powered LED tree by Redditor 'jingle_balls123'. If using a 9V battery, you'll need to connect 6 LEDs (in this example: forward V = 1.5V) in series such that 1.5V*6=9V. This will change depending on the forward voltage of your LED. Next, you choose a resistor that will cause the forward current of your diodes to equal the current flow of the circuit. The link I provided pre-edit will help you design your LED array depending on your battery, # of diodes, and diode parameters.